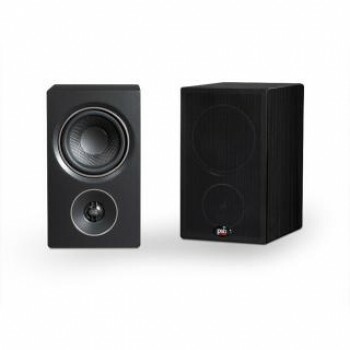 The Alpha P3 is a small two-way bookshelf speaker that connects to any stereo or home theatre system to fill the room with powerful, crystal-clear sound. Featuring a custom 4.5” woofer and aluminium dome tweeter that uses a waveguide to perfectly match the low and high frequencies for a smooth transition, the P3 delivers improved directivity and flattens the frequency response for a more natural sound. It also leverages specially textured woofer cones and a unique port tube design that uses bass flex to add back energy and extend the bass frequencies even lower and without any distortion. All new Alpha Series models employ a ¾” black anodized aluminium dome tweeter that extends the high-frequency response beyond the Alpha’s original measurements and minimizes distortion for a rich, balanced listening experience. A waveguide on the front of the tweeter works to perfect on and off-axis performance while smoothing the response for improved resolution and detail. The ferrofluid cooled tweeter on the P3 has also been precision engineered to sit below the woofer to provide precise stereo imaging at any height. At the heart of every good speaker is a great woofer that produces low distortion and high output levels. With the new Alpha Series, the 4.5” woofer employs dual layer voice coils with a very powerful magnet structure and a cone that is made from a special textured polypropylene compound that prevents breakup. With bass reflex loaded through Paul’s original port tube design from the ’70s, the woofer adds back wave energy to extend the bass response and improve efficiency down to 43Hz. The Alpha Series’ new crossover wasn’t custom designed to simply just direct low and high frequencies to the woofer and tweeter. It was re-engineered to control the directivity and flatten the frequency response while utilizing an unusually complex acoustic Butterworth low-pass filter that is designed to get a perfect blend between the drivers and keep distortion at its lowest even at high volumes. The P3 has a unique combination of wall thickness and bracing to control resonances and provide a perfect platform for the driver components. The P3 cabinet’s internal damping material was first used in PSB’s most high-end models, and has now been adopted by the Alphas and positioned precisely for optimum effectiveness. A premium woodgrain vinyl finish and chrome front baffle highlights combine with magnetically attached grilles to provide a rich and timeless design.